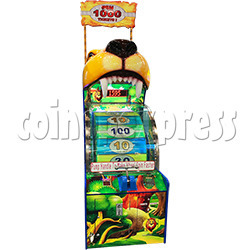 King Of The Big Wheel Ticket Machine for Kid size is an eye-catching, colorful mini wheel game ticket redemption machine from Dino wheel series, features with compact size, especially for young players and easier for shipment, this big wheel games becomes popular by its colorful and cute lion outlook in the amusement center, with cute lion and attention grabbing graphics printing, that amazing colorful scoring wheel and simple and reliable "PUMP" action handle, attracts any player. Easy for everyone to play and a snap for owners to operate. It comes with ticket dispensers, high capacity ticket trays, easy to play with. It is simple play to pull the handle as hard as you can to spin the big wheel, with colorful flashlight around at the spinning time. Earn tickets what the flashlight points out when the big wheel stops.